Following the recent shooting in Parkland, Florida, the world is yet again talking about gun control. 17 people lost their lives to a single shooter on Wednesday 14th February 2018, at Douglas High School, which is not as shocking of a sentence as it should be. Debates in the following weeks have, understandably, been emotionally driven, and can sometimes be lost beneath tears and shouting. This blog post will highlight some of the key arguments against gun control and how they are often disproved by simply looking at the evidence. This argument is a popular one for conservative lobbyists and NRA members alike. In particular, NRA spokesperson Dana Loesch likes to deflect serious questions about controls and new laws by suggesting that mental illness is the only reason why people commit mass shootings. In fact, using this argument merely dismisses the need for further debate. A study in 2015 found that in the decade ending in 2010, less than 5% of all mass shooting events in America were committed by someone with a diagnosed mental illness, despite 1 in 5 Americans living with one. While it is important that mental health services are improved in America, this is not what is being suggested, with conservative commentators instead using lexis which indirectly labels all mentally ill people as ‘crazy’. If indeed this was a mental health problem, which evidence suggests it is not, then should the President be calling the Parkland shooter a “Sicko”? We should instead be debating for more detailed background checks and mental health assessments for prospective gun owners. This argument, then, is not a genuine one. The facts speak for themselves; most mass shootings are not committed by mentally ill individuals, and when they are, the debate is never about how to control their access to weapons. This claim runs on the assumption that civilian ownership can be helpful in the event of a mass shooting. In the thirty years leading up to 2009, not a single mass shooting was stopped or prevented by intervention from an armed civilian. In one instance, a civilian pursued, shot and killed a shooter, but this was only after the shooting had ceased. Now that we know this assumption is based on no factual evidence, why can’t the US ban guns? Conservative arguments often suggest that if gun ownership became illegal, only law-abiding citizens would hand their guns into the government during a gun amnesty. This would leave only criminals with guns, leading to an increase in mass-shooting events and no way to defend yourself in an attack. To approach this argument, we must look at case studies where other countries have imposed similar systems. In the UK in 1996, 16 primary school children and their teacher were killed when a single man used his legally owned handguns to shoot at five and six-year-old children in Dunblane, Scotland. Immediately, there was a debate on new legislation and, ultimately, a ban on guns implemented in 1997. Since then, there has not been a single school shooting, and only one mass shooting event, in 2010. Every year since 1997, there have been fewer than 10 gun deaths in Scotland, where the Dunblane shooting took place, indicating that fears about an increase in use after a ban are unfounded in this case. Australia’s situation is more similar to the US in terms of attitudes towards gun ownership. For many, having a gun was an essential part of life in the bush, but this did not stop changes in legislation after the Port Arthur massacre in April 1996. 35 people were killed and 23 injured by a lone individual. At the time, there were no restrictions on guns other than handguns, but just two weeks after the shooting, debates were already taking place. The same year, Australia passed a law restricting the ownership of all guns and enforcing the use of firearms licenses. There was also a national buyback policy for anyone who had guns which did not comply with new legislation, which gave civilians motivation to comply. Since the new legislation in 1996, there has not been a single mass shooting event in Australia. Looking at this statement, we must look at the Amendment itself. The phrase in question is “the right of the people to keep and bear arms” and was implemented in 1791. At this time, the guns used were not semi-automatic weapons with the ability to kill a large group of people at once. Would it really be an infringement of constitutional rights if guns were limited to safer, less destructive, single-fire weapons? This would still be interpreted as ‘bearing arms’, and so would arguably still be fulfilling the Second Amendment rights that lobbyists are so attached to. In addition, we must consider whether the Second Amendment is something that modern Americans should be proud of. It was added to the US constitution over 70 years before slavery was made illegal, at a time where women were treated as their husbands’ property and had no right to vote or express a political opinion. As we can all agree that the American beliefs on race and gender were wrong at this time, why can we not agree the same about the right to carry a gun? Indeed, it may be true that the Second Amendment is being misunderstood altogether. There were several regulations on gun control in the decades following the Bill of Rights. Gun owners had to go to ‘mandatory musters’ where guns would be inspected, and there were regular door-to-door surveys wherein guns were logged. The idea of the Second Amendment was to promote the safety of the American people, not simply allow everyone to own whichever gun they like. The Amendment itself asks for a ‘well-regulated Militia’, which at the time included civilian gun ownership. Supporters of the NRA should now understand that in order for the US government to serve the constitutional rights of its citizens, there must be strong, clear legislation on the types of guns which are allowed to be owned, and by who. Unfortunately for gun fanatics, complying with the Second Amendment does not allow for ordinary citizens to own and use assault rifles; there is no reason that this is appropriate or safe. With a surge in support after President Trump suggested arming teachers would prevent school shootings, this claim is resurfacing with more determination than ever before. As it was first debated and rejected in the 1920s, we can look to some of the suggestions about gun control from this decade to tackle this issue. There was much pressure on the government at the time, from gun enthusiasts and some media sources, to increase the number of people who could carry concealed weapons, and to take a back seat when it came to strict regulations. This idea was swiftly rejected by lawmakers and the majority of the public, and ‘may issue’ carry laws were implemented instead. These laws made it harder to carry a concealed weapon, as the state may issue you a permit to carry a concealed weapon, even after fulfilling basic requirements. These laws, first seen in the 19th-Century, were so widely accepted that even gun advocates found them reasonable. Up to the 1980s, the NRA themselves did not support the right of every American citizen to carry a concealed weapon, promoting the idea that only those individuals for whom it was necessary to carry a concealed weapon should be granted state approval to do so. So where did the general consensus take such a dramatic U-turn? Lobbyists gained power and money from the mid-1980s in the USA, and so have been able to influence the media and the government. By pumping 30.3 million dollars into Trump, the NRA gained political influence. So, Trump’s suggestion to arm teachers should not be surprising. But would it work? A bill set into motion in Florida on 3rd March 2018 suggests arming highly trained individuals within schools, who would then act as a protector in the case of an attack. Supporters may argue the famous ‘good guy with a gun’ logic can be applied here, and that teachers would use their guns solely for the protection of their students. But what happens when a teacher snaps? We must consider the implications of arming teachers, an overworked group who are often loaded with stress and paperwork. Just two weeks after the Parkland shooting, Jesse Davidson, a teacher from Dalton Hugh School barricaded himself in a classroom and unloaded a shot. Fortunately, Davidson was alone in the room and there were no injuries, but we must ponder just how much worse this situation could have been. Student safety will not be increased by guaranteeing a weapon in the classroom. It certainly will not prevent school shootings. Indeed, in the case of the Parkland shooting, an armed security officer was present at the school but did not enter and address the shooter. This was an individual who had over 30 years’ experience as a sheriff’s deputy, but in the moment could not bring himself to enter a live shooting scenario. This situation helps to place emphasis on the role of human emotions and natural responses in life-threatening scenarios. So why would arming teachers, whose jobs are not remotely related to armed security, help prevent school shootings? While it is clear that a calm and civilized debate must occur in the US over gun control, it is also clear that some arguments already put forward are not supported by evidence. It is imperative that any measures implemented consider evidence-based arguments and previous research and case studies. After assessing some of the loudest claims about gun control, it is clear that more guns are not the answer. Whether it be teacher or civilians with concealed handguns, more bullets and more adrenaline-fueled firing will not have positive effects on US citizens, particularly the only people guaranteed to be unarmed: innocent children. The mission statement of Women to Women for Peace (W2W4P) was “World Peace will come through the will of ordinary people like yourselves”. This encapsulates in a nutshell why the organisation – founded in 1984 – enjoyed thirty years of success. Lucy Behenna, founder of Mothers for Peace (later became W2W4P). This was a powerfully motivated group of people who came together to build bridges between people from countries which have contrasting and conflicting political, philosophical, cultural and religious interests. The aim was to promote the message that war was not the answer to resolving conflict by supporting intercultural understanding on a transnational level. W2W4P had numerous highlights throughout their duration as a non-profit organisation that accentuate their success as an international solidarity movement. I will illuminate some highlights over the course of two articles about the South West and Wales group of W2W4P who achieved undoubtable success for peacekeeping from Wales to Cuba, America, Israel and Palestine, starting with their achievements in Cuba and America. It is my hope that when you read the articles I have written on the inspirational work of Women to Women for Peace, you will feel the same as I felt; that there are lessons to take away and how vital it is to have international solidarity movements. The work of W2W4P has left me feeling proud of Wales for being part of an amazing peacemaking organisation that strove for pacifism internationally as well as locally; they brought solidarity to our front doors. I feel positive that there is always something an individual or collective group can do to reach out and show support to other countries in distress. I am also questioning whether we are lacking this sense of solidarity and peacemaking now, which I evaluate further in a second article. I have had an uncomfortable realisation that many issues addressed over the course of these articles can be directly related to today’s struggles (inequality, discrimination, oppression, exploitation to name a few). Perhaps we are led to think about more conflicts going on around the world but we may be doing less to help now, than we were in the late 1990s and early 2000s. It is my pleasure to take you through some major turning points and highlights of W2W4P. I want to draw upon their links to Wales, explain what they stood for and to take some lessons from this organisation in the hope that you too are inspired to keep fighting to make a difference. 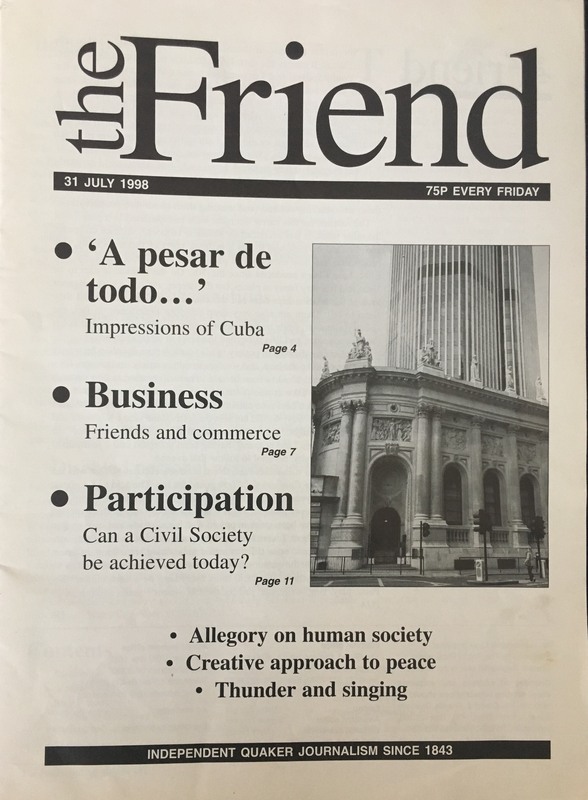 In 1998, four delegates of W2W4P (including a Welsh representative) were given the opportunity to travel to Cuba for the ‘International Independence, Sovereignty and Peace’ conference. There were roughly 3,000 women from 75 countries present and they were all women from dramatically diverse circumstances. This represents an amazing collaboration of peace organisations across the globe who were all striving for the same goal; peace. This was a chance to build bridges with other organisations worldwide and such links were made with peace workers from Brazil, Cyprus, US, Italy, Cuba, Ireland and many more. There were many positive far-reaching consequences from the experience; strong networks were built on cooperation and it showed that international solidarity can counteract powerful negative influences. A highlight of the Cuba visit was a speech from Fidel Castro. In his speech he passionately explained his world view – that the world’s preoccupation with profit was at the cost of humanity … for the sake of the global economy. This statement rang alarm bells for me as it seems there are parallels with our situation in 2018, hence my view that we need a resurgence of a group such as W2W4P. 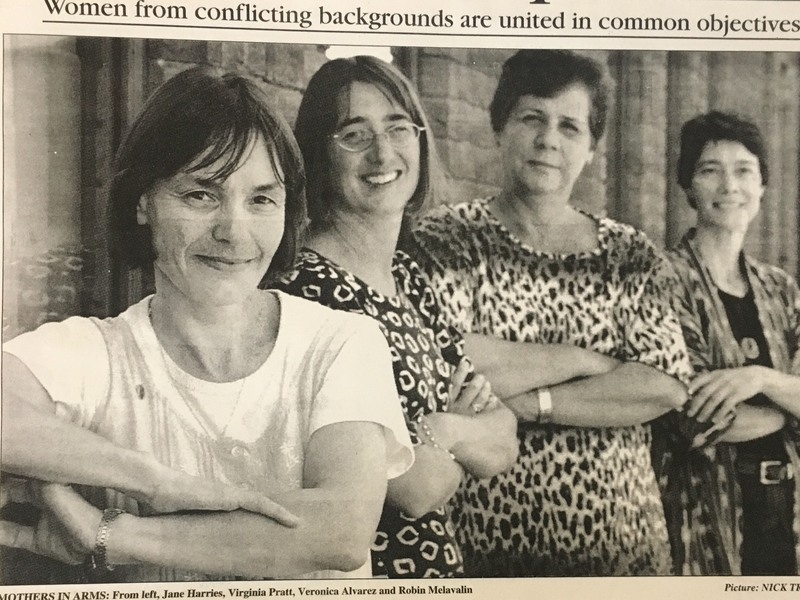 The most successful outcome of the W2W4P visit to Cuba in ‘98 was the building of friendships with women from Cuba and America; this led to a reunion in Wales in 2001. W2W4P were eager to raise further, real awareness of the Cuban situation because they had witnessed first-hand the extent of the suffering that Cuba was enduring because of the blockade imposed by America; far more than had ever been published by the media. The ladies from the peacemaking organisations across the three countries all sought this opportunity to develop closer and stronger relations with each other, to deepen the understanding of the situations in each country and to bring awareness to Wales about the injustice of the American Blockade. It was the perfect opportunity for the ladies of Cuba and America, two conflicting countries, to tell their official and unofficial story of the US blockade as a method of spreading the message and fighting for peace. It was quite special to have women from Cuba and America over to Wales to enjoy and appreciate our city of Cardiff, vibrantly multicultural and home to fascinating buildings such as the Temple of Peace. Veronica Alvarez, of the Cuban peacemaking organisation that visited was warmed by the kindness and concern of W2W4P because it showed a humbling sign of solidarity, that other countries and people care for peace in societies other than their own. One of the American visitors Robin Melavalin had some encouraging words about W2W4P; that they were impressive and showed an excellent model for peacemaking. Robin was able to meet people from Cuba in a neutral country and have time to get to know them. It really helped build bridges, relations and gain a key understanding of an array of perspectives on international issues confronting them. The W2W4P delegates who attended the conference in Cuba witnessed a multiracial society with no visible signs of prejudice or discrimination. This ought to be a lesson that many countries and communities today could take away with them. Cuban citizens also held a political and economic view about the blockade which was very reasoned and factual; the people showed no signs of aggression or bitterness towards their political oppressor America; another lesson that some nations could learn. The ladies from W2W4P who spent time in Cuba noticed that partly because of the blockade Cuban streets were visibly deteriorating and crumbling due to lack of resources and materials, yet the atmosphere was still vibrant with a huge amount of culture that was itching to be shared. It was moving to experience a country who was suffering terribly but who still stood strong, where people were passionate and proud to be who they were. Isn’t this the kind of lens through which we need to look at Palestine, Iraq, Yemen or Afghanistan, for example? Each have their own cultural and political background yet are under immense pressure to conform to a particular version of democracy. The work of W2W4P brings me to the daunting conclusion that we still don’t seem to be capable or accepting a multi-faceted world. One thing that is apparent here is that media has a powerful influence over international conflicts and issues, by promoting often superficial views. W2W4P’s visit to Cuba, and the return visit to Wales made it possible to witness and understand the true impact of the American blockade – aspects that weren’t seen in the media. What Cuba and America’s differences came down to and what we still witness today is that they have different political systems, a different ideology and different priorities which is part and parcel of a multipolar world. The government and organisations in Cuba were able to create solidarity with organisations across the globe, and it is in my belief that every country still needs to fight for this. Today, we are still witnessing vicious cycles of exploitation and suffering and although peace may be unattainable to many, the situation could still be improved. The first step is perhaps to create awareness, as is shown in the story of W2W4P. 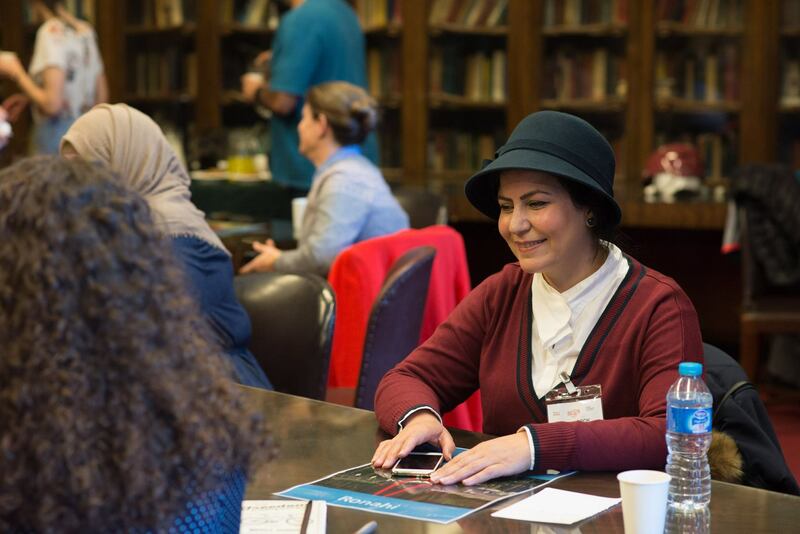 For more information and stories from the Women to Women for Peace successes, please read my other article about the time when women from Israel and Palestine came to visit Wales! Mothers for Peace report on International Encounter of Solidarity among Women: Havana, Cuba – April 1998. Jane Harries, ‘Pesar de todo…’, The Friend, 31 July 1998. Emma James, ‘Mothers rise above the arguments of nations’, The Western Mail. 22 August 2001. The organisation consisted of a group of likeminded people who came together to build bridges between people from countries which have contrasting and conflicting political, philosophical, cultural and religious interests. 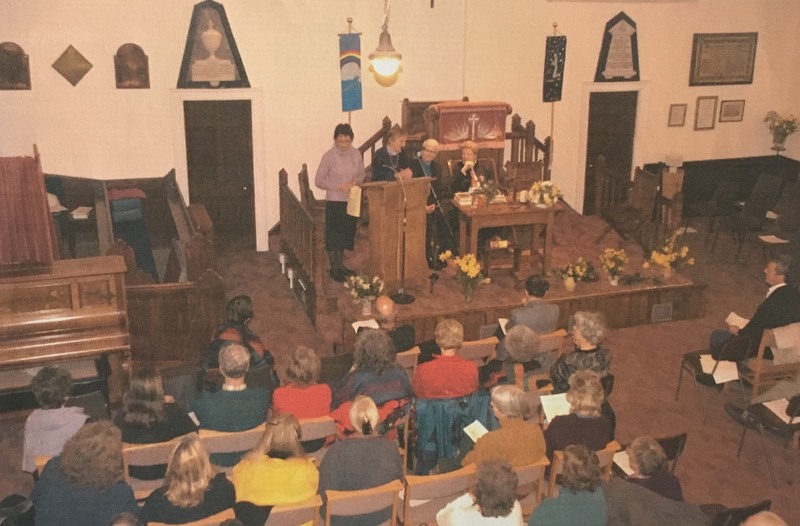 W2W4P had numerous highlights during their thirty-year history as a non-profit organisation working for international solidarity. I hope that once you’ve read my articles you feel the same as I felt; that there are lessons to take away and how vital it is to have international solidarity movements. The work of W2W4P has left me feeling proud of Wales for being part of an amazing peacemaking organisation dedicated towards pacifism internationally as well as locally, bringing solidarity to our front doors. I feel positive that there is always something an individual or collective group can do to reach out and show support to other countries in distress. “It is difficult to gauge the impact that W2W4P had on my life and that of my family for many years. When our children were small we opened our home to a variety of extraordinary peace women. There was Marina, who traipsed all the way from Moscow to Bridgend on the train, bearing traditional Russian ornaments which still grace our living room. Then there were the women from the former East Germany who were part of the street protests in Dresden which started the decline of the DDR and led to German unification. As our children grew I was able to travel further afield and play an active role in visits that helped to break down prejudices and stereotypes between women from countries in conflict: Cuba and America; Israel and Palestine. Thus W2W4P was able to contribute to building bridges of understanding and to help create networks focused on creating peaceful relationships. 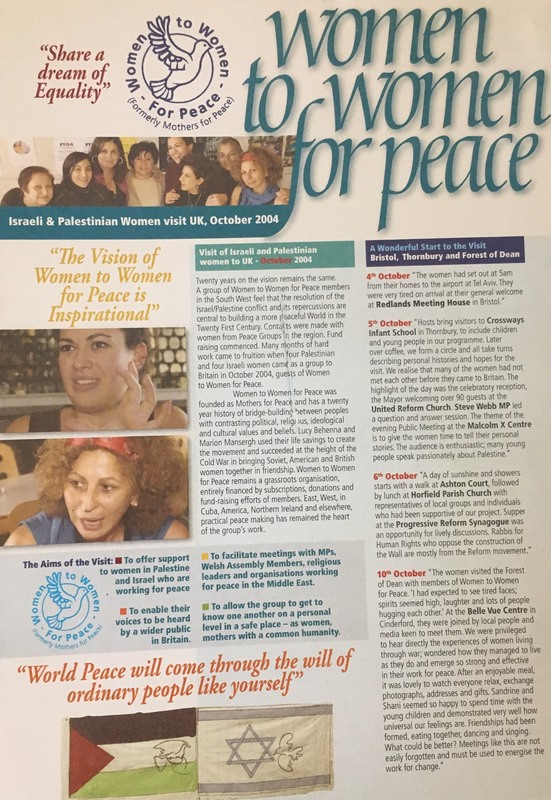 A successful example of W2W4P’s success in building bridges between people with contrasting values and beliefs happened in 2004 when 8 women from peace organisations from Israel and Palestine came on a joint visit to the UK, including Cardiff, Wales (where they spoke at The Temple of Peace). I would like to invite readers to explore the motives and outcomes of such an important visit, and to learn more about international solidarity in action. To help build up a network of support for women and families in Israel and Palestine (two conflicting countries). Promote a more accurate international awareness regarding identity and presence. The need to keep getting the message out so people will feel galvanised into activity out of conviction, not sympathy. To engage in a mix of formal and informal meetings with the public, politicians, influential audiences and the media to promote awareness of the subject. For it not to be seen as solely a security problem . Strong emphasis on occupation, inequalities, values and human rights. To break down international barriers and break through stereotypes, which are so often a big factor in conflict and crisis. To promote a vision of peace and solidarity, and how it is possible through the will of ordinary people. To establish a real nucleus of friendship. To work on existence and existing identities. To develop a spirituality based on justice, peace, nonviolence, liberation and reconciliation for different national and faith communities. To give the women a public platform, so their voice can be heard by the media, politicians and many other influential members of public. Overall the visit was extremely successful. It was noted that the women from Israel and Palestine were brave, committed and shared the same hopes and concerns as women and families in Wales. Although they came from countries experiencing bitter conflict, the ability to meet and share their realities in a neutral safe space, enabled the women to develop a warm and affectionate relationship. They fed back to members of W2W4P that they found the visit to the United Kingdom a positive experience and wished to continue their cooperation in the future. The visit encouraged a more informed understanding of the ways people were working for peace in the region. It was endearing that the women felt heartened and impressed by the level of support they were greeted with in Wales and England; they felt people’s concern for their respective communities, and for their work for peace under difficult circumstances. The Israeli and Palestinian women returned home with a vision for the future. They had gained inspiration from their visit and were able to formulate new ideas about how to move forward in their fight for peace and how people in the UK could support them in this. On returning home, they were able to organise joint initiatives and to meet in Jerusalem – building on the positive relationship that was made possible through the work of W2W4P. Over its 30 year existence, the work and experience of W2W4P was tremendously valuable and rewarding. A lot can be achieved if we allow it to happen. The results from international solidarity movements can only be positive. There is so much to learn beyond our borders and re-creating an organisation like Women to Women for Peace could allow us to make a positive contribution to peace in conflicting countries. The motivation and dedication of members of W2W4P represents a desire for peace and friendship that can expand over oceans and cross national boundaries. It’s difficult to actually put into words how W2W4P held such inspirational and influential links to Wales in their fight for peace for thirty years. As an individual I am certainly proud of their achievements and want their successes to be heard. Lucy had “instinctively tapped into the most powerful peacemaking power in the world” and we need it back again! Plaid Cymru press release October 2004, Jill Evans MEP. Jane Harries, ‘Report of a Visit by Palestinian and Israeli Women to the UK – October 2004’. October 2004. 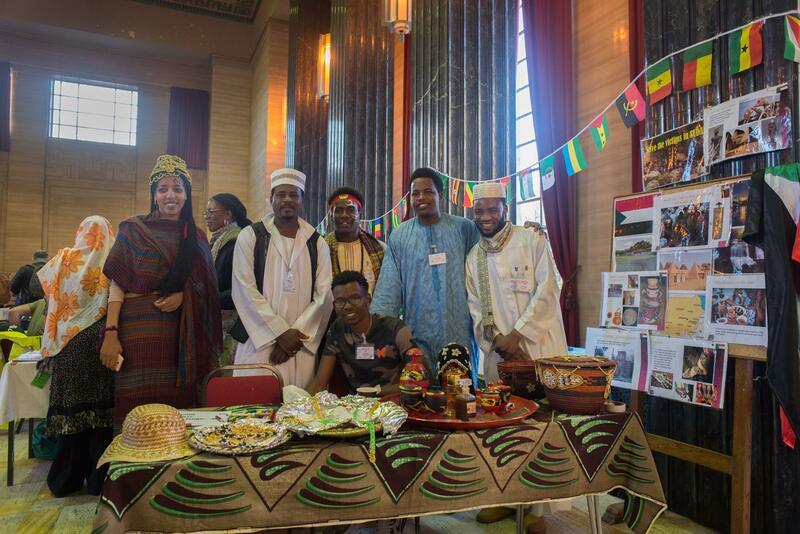 On 25 November over 250 people attended the Human Library Festival at the Temple of Peace, Cardiff organised by young volunteers from the Welsh Centre for International Affairs and refugee volunteers from Oasis Cardiff. 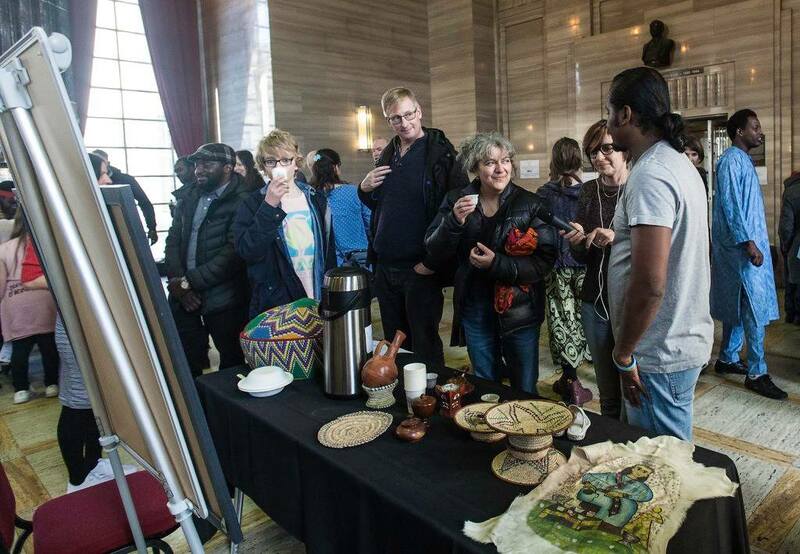 Attendees had the chance to explore all the interesting activities provided by organisations such as Stand up to Racism and The Welsh Refugee Council; listen to all the great musicians performing throughout the event; and try traditional dishes and sweets from around the world. So what is a Human Library Festival? A Human Library is just like an ordinary library, however, in this case the books are replaced with people, who are happy to share their life stories with anyone interested. 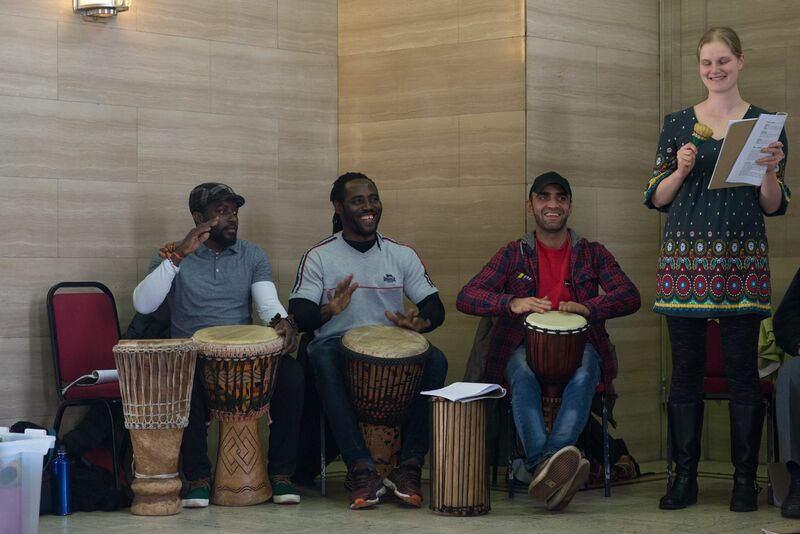 Our Human Library Festival featured books who had stories to tell about immigration and asylum-seeking in Wales, human rights issues and integration. For instance Amanda Morris talked about being a feminist who wears an Islamic headscarf; Paul Battenbbough chatted about what it is like to teach music in Oasis Refugee Center and Gareth Bonello explained how he has been campaigning for Human Rights through music. who left very positive feedback. A politics student from Cardiff University said he has learnt a lot about Human Rights and immigration related issues though these conversations, another attendee wrote this on the Library’s white board: “It was great to hear some inspirational stories. I must do more to support migrants and learn from them!”. It wasn’t only the audience that benefited from the event. The event was organised by young volunteers and asylum-seekers themselves, who enjoyed working together, building skills and becoming friends in the process. related to integration and Human Rights. For instance, one such organization, People & Planet called the attention to the unjust distribution of economic benefits and their environmental costs in the world. Food played a central role during the event – people had the chance to try different nations’ traditional dishes and sweets, while the Eritrean stall also gave the chance to explore coffee-making traditions and have a nice hot and refreshing traditionally prepared Eritrean cup of coffee! Sudanese curry, Turkish sweets, Omani dessert, Lebanese finger food and much more was served some of which was kindly donated by local City Road restaurants Deli Fuego, Al Wali, Saray and Mezze Luna. http://www.bbc.co.uk/programmes/b09g655c (time code: 2:13:13 – 2:18:15). Also, Journalism student Sagnik came along to the event and and was inspired to make this video. Check out our Flickr account as well to see pictures of the event. Many of the Human Books said they’d be more than happy to share their stories in the future, and many attendees inquired about the next Human Library event. Thank you to People’s Postcode Trust, entirely funded by players of People’s Postcode Lottery for funding the event. By Jane Harries, Cymdeithas y Cymod peace activist, human rights observer and Wales for Peace Learning Coordinator. The Marble Hall of the Temple of Peace and Health in Cardiff was packed to overflowing on the evening of 18th October 2017, the air thick with expectation. The Cardiff Branch of the United Nations Association (UNA) had brought together two eminent speakers to talk about the historical context and present consequences of the Balfour Declaration – a document whose centenary is marked today, 2nd November. It was clear we were in for an interesting evening. So what was the Balfour Declaration, and why should we remember it today? Does it have any significance for us in Wales? The first speaker, Avi Shlaim – Jewish historian, Emeritus Professor of International Relations at the University of Oxford and married to the grand-daughter of Lloyd George – started off the evening with a historical analysis. He defined the Declaration as a typical colonialist act. The British had no moral or legal right to give a ‘national home’ to Jewish people in Palestine, having consulted neither with the Arab leaders, nor the Jews nor the British population. Nor was Palestine theirs to give. Behind the scenes there were political motives. David Lloyd George wanted Palestine for the British in order to gain influence over the French and because of access to the Suez Canal. He also wanted to dismember the Ottoman Empire and was willing to engage in double dealing to do so. Overtures were made both to Arab leaders and also to the Zionists, whom Lloyd George regarded as powerful and influential. Jews had lived scattered across the globe before the First World war but at the end of the 19th century a nationalist Jewish campaign grew up in the form of Zionism, whose aim was to establish a national home for the Jews. Zionism particularly appealed to Lloyd George, steeped as he was in the Biblical passages and hymns of his chapel upbringing. This deep emotional connection may have been one reason why he became influenced by Dr Chaim Weizmann, Zionist Leader in the UK and later first President of Israel. And so Lloyd George’s government bowed to Zionist pressure and issued the Declaration, ignoring other Anglo-Jewish voices at the time, including Edwin Montagu, the only Jew in the cabinet. The second part of the Declaration is often forgotten – that is that the civil and religious rights of ‘existing non-Jewish communities’ in Palestine (over 90% of the population at the time) should be respected. The British Mandate in Palestine, issued by the League of Nations in 1923, included a responsibility to implement the Balfour Declaration. The Mandate was, however, essentially pro-Zionist and led inevitably to the series of events we are familiar with today: the Arab revolt of 1936 – 39, the rise of Zionist terrorist activity against the British and Palestinians, British withdrawal from the region, and the foundation of the State of Israel mirrored by the Palestinian Nakba (= catastrophe, mass migration) in 1948. The Israeli- Palestinian conflict is one of the most entrenched in the world and continues to blight lives today. This is particularly true for the Palestinians, who have seen their homeland shrink and their human rights whittled away under a now 50-year military occupation. Even the area which the British government recognises as a future state for the Palestinian people is now occupied by 700,000 Israeli settlers. The second speaker, Professor Kamel Hawwash of Birmingham University, Palestinian commentator on the Middle East, explained the consequences of Balfour today. He outlined the effects of the Israeli Occupation for those living on the West Bank, including loss of land, freedom of movement and livelihood, difficult access to education and health care, and subjugation to continuous harassment and violence. In the Gaza Strip the population essentially lives in an open prison, deprived of many resources we take for granted, including clean water and proper sewage systems. He then turned his talk to address an unusual question. The state of Israel is more or less exactly the same size as Wales. What would be the situation today if the Balfour Declaration had promised a homeland for the Jewish people in Wales, not in Palestine? Using parallel maps, he brought this supposition to life, with swathes of Welsh land having been taken up into the State of Israel and Cardiff a divided city. This helped us to see the Declaration from a different perspective. As the evening wore on, there was strong feeling from one young member of the audience that the speakers were one-sided; she pleaded to hear the other side. A student of Atlantic College, it appeared that she had spent a lot of time listening to the arguments of Palestinian and Israeli students living in her house. So what can we say about the Balfour Declaration that is more balanced and even positive? The Balfour Declaration was of its time – as Avi Shlaim said essentially a colonialist document – so perhaps it should be judged as such. It feels obvious from the wording of the document that the author was trying to balance what was felt to be a justified case for the Jewish people to have a homeland with the rights of the indigenous population. The problem is that this double-dealing didn’t work out in practice, with both sides seeing the British as compromising their cause. And are we really justified in thinking that such a declaration or deal couldn’t be made today – for oil, or influence, or post-Brexit trade deals? It is true that Jews have been persecuted over centuries, including in pogroms in the late 19th and early 20th century. In a humanitarian global society, we surely would applaud the attempt to offer a safe haven for the persecuted, and the Balfour Declaration can be seen as such. What wasn’t foreseen, however, was that those persecuted may turn persecutors in their turn and deprive the indigenous population of their rights. What would the authors of the Declaration today say to the descendants of the 750,000 Palestinians forced to flee their homes in 1948 – and some again in 1967 – many still living in refugee camps across the Middle East? Theresa May has talked about her ‘pride’ in the Balfour Declaration and in the creation of the State of Israel, a key ally for Britain in the Middle East. Whilst rejoicing that persecuted Jews, including Holocaust survivors, found a homeland in Palestine, what do we feel about the plight of the dispossessed? Theresa May’s current government supports a 2-state solution in principle. What does the perpetuation of a military occupation do to the soul and psyche of the Occupier? Surely a conflict that is allowed to go on for so long cannot bring good for either side. The Balfour Declaration is not a document that people know much about in the UK. In Palestine it is part of everyone’s awareness – generally recognised as the starting point from which everything began to unravel, leading to a continuous process of dispossession which continues today. To illustrate this point let me take you back to an August evening in East Jerusalem in 2012. At the time I was serving as a human rights observer on the West Bank and that evening we were called to an incident in Silwan. When we arrived we realised that the cause of the problem was seemingly small: an Israeli settler had parked his car in the middle of the road, preventing people from moving up or down. It was however Ramadan, and just before the breaking of the fast, and tempers get frayed. As we started talking to local residents and the Israeli armed police who had inevitably arrived, the expected question came: “Where are you from?” “Britain”, we said. “Ah, Balfour!” the local resident retorted – and went off into a tirade. The good thing was that once this had blown over he started joking with us, and the tension was released. The settler moved the car, and the incident passed off without any repercussions. This was not a lone incident, however. I have lost count how many times I have had to apologise for Balfour on the West Bank. Bearing everything in mind how do we, the present generation, view the Balfour Declaration? On the positive side, we can see it as an attempt to be balanced and to provide safety and security for persecuted Jews. It certainly was instrumental in the events leading to the creation of the modern State of Israel. It can also be seen as an essentially political deal – an attempt to favour those who were believed to have influence whilst paying lip-service to the Arab leaders. It is hard to avoid the reality however, that the Declaration set off a string of events in the region which still have repercussions today, resulting in one of the world’s most intransigent conflicts and spelling death, dispossession and poverty for thousands. The final installment of Jane Harries’ blog series concerning her recent visit to Israel and Palestine. Friday 14th July. On the face of it we had a very easy journey to make. Firstly we would visit R., an Israeli (originally from the US) living in the Gush Etzion settlement and an Alternatives to Violence Project(AVP) facilitator to discuss how she might like to develop AVP workshops in the future. We would then cross over the Israeli-controlled Route 60 to visit the Palestinian grassroots leader Ali Abu Awad in his compound before returning to Bethlehem. All these places are within a few kilometres of one another. The difficulties we had getting from one place to another highlights the complexities of negotiating human encounters in a land characterised by segregation and military occupation. Our journey began when we picked up a taxi from Manger Square in Bethlehem in the occupied Palestinian territories. When we told our driver that we wanted to go to the Gush Etzion settlement, he was already nervous, and explained to us that he could only take us to the Junction, but wasn’t allowed into the settlement itself. We explained that we knew this, and that we would be met by a friend from the settlement. As we set off our driver told us that there had been army incursions into Deheishe refugee camp in Bethlehem that night, and that a resident had been killed. This was causing a lot of delays at checkpoints. Armed with this knowledge, he did what Palestinians are used to doing all the time: he found a way round that avoided the checkpoints. So much for security, we mused…..
We were dropped off near to the Gush Etzion Junction on Route 60, not far from a settler-only bus stop. Here there was a group of armed soldiers, who were initially wary of our group: five Westerners – strangers – all with ruck-sacks. (The Gush Etzion Junction has seen a number of violent incidents over the years, including as recently as November 2015). We soon got into conversation, however, even if this was at quite a superficial level, and one of them showed interest in what we were doing on the West Bank and Israel, supporting people to deal with conflict better. We were picked up by R. and taken to her house. Gush Etzion has an interesting if controversial history. It is in truth a cluster of settlements comprising at least 70,000 people. The core of the settlement block is the site of what were four agricultural villages, established between 1940 and 1947 on land purchased in the 1920s and 30s. These villages were destroyed during the 1948 Arab-Israeli war, and then left outside of Israel at the 1949 Armistice. After the 1967 Six-day War and the occupation of the West Bank, the villages were rebuilt and reclaimed by Israeli settlers. The extent of the present settlement, however, far exceeds the original site, taking in swathes of privately-owned Palestinian land. Israeli settlements on the West Bank are regarded as illegal under International Humanitarian Law (Article 49 of the Fourth Geneva Convention) and by most of the international community. I was surprised by how small R’s house is, and found myself wondering how it must feel to live in this gated community, constantly guarded by soldiers and with the knowledge that the legality of one’s existence in this place is disputed by international law. How could one feel comfortable in one’s skin? We didn’t go into this, although the elephant in the room remained (for me) during the whole of our conversation. We sat at the table in their small kitchen drinking coffee whilst preparations were taking place for Shabbat – a lot of chopping and putting things into large cooking pots and the preparation of dough, which R’s small son delighted in and tried to share with us in small balls. R. shared with us that she had been involved in the organisation Kids4Peace which aims to promote integration and understanding between Palestinian and Israeli children through summer camps, but that she had left because she didn’t feel that the interests and concerns of Israeli Jews and Palestinians were treated equally. She also expressed interest in developing AVP work in hospitals. I have no doubt that R. is sincere and really wants to use her knowledge and experience of AVP in some way that will be beneficial to society. At the same time, this visit raised many dilemmas for me. How can we resolve conflict without looking honestly at its root causes? R. and her small family – like many others in Gush Etzion I presume – have now put down roots in this place and feel that they belong, but at what cost to others? If injustice and inequality aren’t addressed, what hope is there for a real and lasting peace? How can this happen if the two communities never come together, ready to really hear one another’s experiences, deepest feelings and aspirations? How can it happen without a political solution? As we re-crossed the busy Route 60 and headed towards Ali Abu Awad’s compound on the other side, all these questions were rankling in my head. I assure him that it’s perfectly safe, but how can I convince him? The whole of his upbringing and training as a soldier tells him differently. Ali isn’t at home. After a phone call we find that he has gone to a family wedding, so we now face the journey back to Bethlehem in the midday heat. Back out on Route 60 we come across another settler bus stop on the other side of the road. We know there is no point waiting there to get back to Bethlehem – so close and yet on the other side of the political divide. A soldier approaches us and asks where we want to get to. We explain that we want to return to our hotel in Bethlehem. ‘I wouldn’t go there’, he says ironically, his gun poised ready for potential use: ‘it’s not safe’. I assure him that it’s perfectly safe, but how can I convince him? The whole of his upbringing and training as a soldier tells him differently. We trudge on a little up the slope and start hitch-hiking, looking out for the cars with green Palestinian number plates. We have only been there a short time when a rather rickety car pulls up. When we explain where we want to go, we are immediately invited in. We pile in and – squashed up together – feel relieved to be in a welcoming space. During the journey the driver tells us of some of his experiences – familiar stories of hardship and injustice. He drops us not just anywhere, but right on Manger Square, yards from our hotel. True, it may not be safe on the West Bank: one might just suffer from too much generosity. Jane’s own blog can be accessed here.